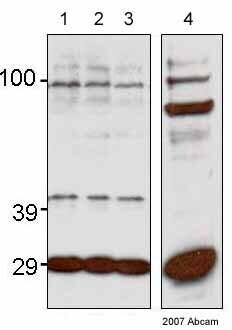 This antibody recognizes human and murine FLIP gamma and FLIP delta It does not recognise FLIP alpha and FLIP beta. , corresponding to C terminal amino acids 191/209 of Human FLIP delta + gamma. (Peptide available as ab8458). Jurkat cell lysate. 35 kDa and 25 kDa bands can bedetected. Apoptosis is related to many diseases and induced by a family of cell death receptors and their ligands. Cell death signals are transduced by death domain (DD)-containing adapter molecules and members of the ICE/CED-3 protease family. Caspases-8 (FLICE) and -10 (FLICE2) are two pivotal members in the ICE/CED-3 protease family. FLICE-inhibitory proteins were identified in virus and human and designated v-FLIPs and c-FLIPs, respectively (1,2). The human FLIPs were also cloned by several labs independently and termed Casper, I-FLICE, FLAME-1, CASH, CLARP and usurpin (3-7). FLIP contains two death effector domains (DEDs) and a caspase-like domain. FLIP interacts with adapter protein FADD and caspase-8 and –10, and potently inhibits apoptosis induced by all known death receptors CD95, DR3, TRAIL-R and TNFR1. Four splice variants of c-FLIPs have been identified and termed FLIP alpha, beta, gamma, and delta, respectively (8). Our Abpromise guarantee covers the use of ab8423 in the following tested applications. WB 1/1000. 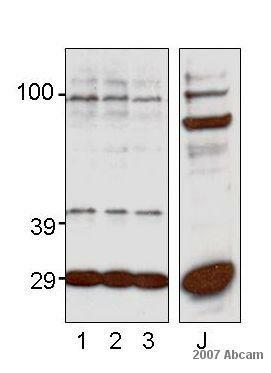 Detects a band of approximately 35 kDa.Can be blocked with Human FLIP peptide (ab8458). FLIP (or CASP8 and FADD-like apoptosis regulator) is an apoptosis regulator protein which may function as a crucial link between cell survival and cell death pathways in mammalian cells. 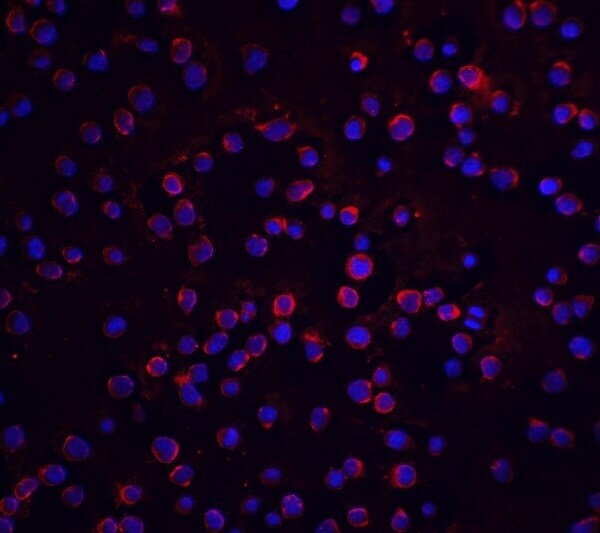 Acts as an inhibitor of TNFRSF6 mediated apoptosis. A proteolytic fragment (p43) is likely retained in the death-inducing signaling complex (DISC) thereby blocking further recruitment and processing of caspase-8 at the complex. Full length and shorter isoforms have been shown either to induce apoptosis or to reduce TNFRSF-triggered apoptosis. Lacks enzymatic (caspase) activity. Ab8423 at 20μg/ml staining FLIP delta + gamma in Jurkat cells by ICC/IF (Immunocytochemistry/Immunofluorescence). Observed band size: 30,44,98 kDa why is the actual band size different from the predicted? Publishing research using ab8423? Please let us know so that we can cite the reference in this datasheet.